This best apple crisp recipe ever is easy to make, crunchy, sweet, delicious, and makes the house smell wonderful. This apple crisp recipe has been handed down from one generation to another, and it's best to keep things simple. Sometimes simple is the best. The star of the best apple crisp recipe is obviously the apples. In my opinion the tart apples are the best, but you can experiment and chose the apple of your liking. Personally, I think the "Granny Smith" apple" takes this dessert over the top. For the absolute over-the-top experience, serve this apple crisp while warm with vanilla ice cream. YUM! If you appreciate visual demonstrations, we created a video that you can watch below which covers the recipe for A to Z. One work of advise. Make sure you make plenty of this. It goes quickly. In fact, you might want to keep apples on hand. It's an easy dessert for "last minute" situations. Place apples in a pie pan or ceramic cookware. Sprinkle the apples with the sugar. In a separate bowl, combine the remainder of the dry ingredients and mix, making sure the brown sugar is fully incorporated. "Cut" in the butter to the dry ingredients with a fork. Basically mix it in until the butter is well incorporated. Spread the oat mixture over the apples. Bake at 375 degrees Fahrenheit for 25 minutes or until bubbly and crisp. Serve warm with vanilla ice cream. This short video gives you the details on the best apple crisp recipe ever. Dave is great at getting back to you with answers to any questions you might have. Click Here and ask your question. Dave usually gets back to his readers within 24 hour, maybe sooner! 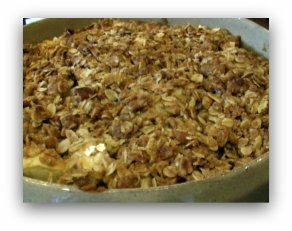 Click here leave best apple crisp recipe return to BBQ My Way homepage.